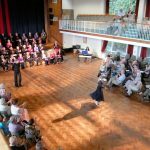 The objectives of The Marchington Singers are to advance, improve, develop and maintain public education in, and appreciation of, the art and science of music in all its aspects by any means the trustees see fit, including through the presentation of public concerts, recitals and organising workshops. The Marchington Singers became a registered charity in 2017. Every year we try to give a little back to the communities and charitable groups who have supported us or with which we have links. As well as organising regular raffles, we have sung in a variety of venues including supermarkets and cafes in our attempt to support local and national charities. For several years we have provided Christmas entertainment at local care homes. In addition, we frequently donate some of the proceeds of our concerts to worthy causes. Raising funds for Halfrida House, a local women’s refuge with some hearty festive singing we raised a fantastic £180! This is still a work in progress!